The checklists are all in an easy-to-use worksheet/quiz format. Simply work your way down the list of questions, checking off boxes where your campaign is on target. 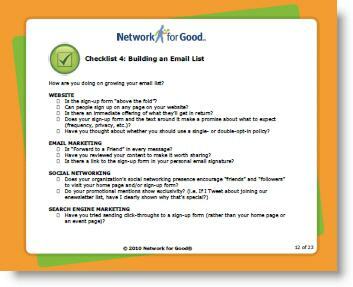 Add up the checkmarks to see how you score and which areas of your online fundraising plan need a bit more attention. Not quite sure of the next step? Each section of the ebook includes a list of helpful free resources to help you polish up your online fundraising practices. Register with Network for Good at http://web.networkforgood.org/201001ebook to download your copy of The Online Fundraiser's Guide.